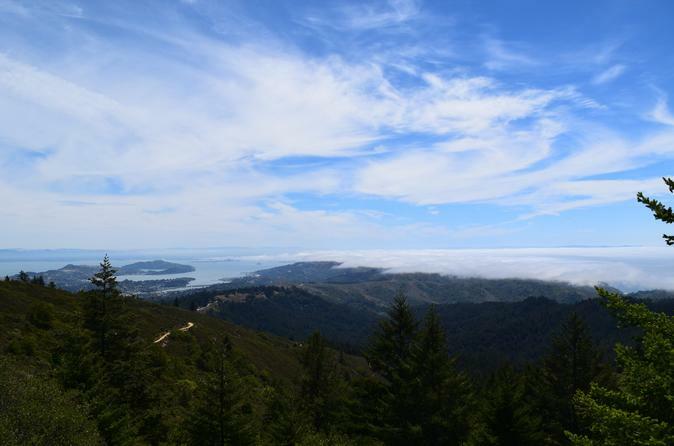 Explore a range of terrain on foot, including coastal redwoods and oak woodlands, on this 6-hour hiking tour at Mt. Tamalpais. Known simply as Mt. Tam by Marin County residents, the mountain trails provide spectacular vistas from every turn. Your guide provides round-trip hotel transport from San Francisco. Start your 6-hour itinerary with pickup from any hotel in San Francisco. Then make the journey with your guide across the Golden Gate Bridge to Marin, and disembark your vehicle at Mt. Tamalpais (entrance fee included). The hike takes you along the south face of Mt. Tam, which features sweeping views of San Francisco Bay and the world-renowned coastline. Keep your camera on hand while you trek past towering redwoods and alongside seasonal streams. The trek begins with a steady descent down the mountain and includes a brief stop at the historical West Point Inn for refreshments. Then you'll continue on a hiking path into the tranquil forest before making your way to open trails with additional views. Afterward, relax on the return drive to the city.